“The kids enjoy it. We all have a lot of fun. But soon we will get down to work in each classroom,” Principal Andrea Moyer said. Malabar’s 700-plus students sat in orderly rows in the gym for morning assembly, laughing and pointing at staff in an array of costumes that ranged from elves and the Three Wise Men to orchestra teacher Ashley Rudd’s tiered Christmas tree dress, complete with blinking lights. Assistant Principal Tom Hager, microphone in hand, led the judging of costumes based on students’ responses. The kids applauded their approval of all costumes and roared with laughter at the rapping antics of sunglass-wearing teachers Don Walter and Lisa Koplan. First-place applause went to teachers Amy Bartlett and Brad Strong, costumed as characters from Rudolph the Red-Nosed Reindeer and the Island of Misfit Toys. Strong was clad as Charlie in the Box and Bartlett, peering from a small slit in the smokestack, as the Train with Square Wheels. The two teachers have been developing themed costumes together for four years. “We put a lot of work into this,” Strong said. “We actually began developing our theme over the summer.” Bartlett nodded her smokestack in agreement. The brief assembly celebration neared its conclusion when Moyer took the microphone to remind students to work hard in class on their final day before the start of winter break. They will return on Jan. 4. As Hager led, the entire student body stood together, faced the large U.S. flag on the north wall of the gym and recited the Pledge of Allegiance. Then it was time for classes to begin. 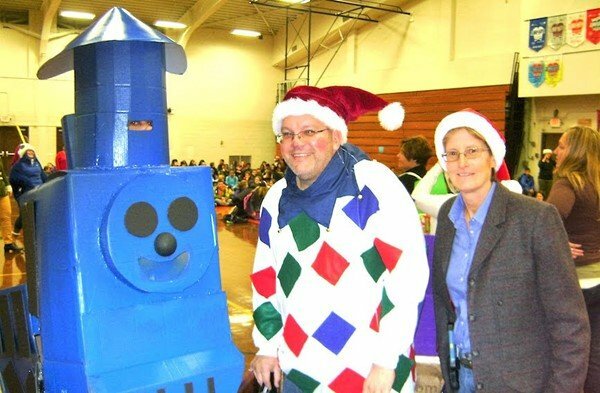 Photo: Principal Andrea Moyer stands with teachers Brad Strong and Amy Bartlett, costumed as characters from the Land of Misfit Toys.